This immersive CPD day will look at how technology can be used to support teaching and learning in geography, history, RE, music and science. The day aims to introduce a range of software and hardware that can be used effectively to teach these subjects and across the curriculum. Emphasis will be on ensuring the correct technology is chosen to support the context and consideration is given to sound, evidence-informed pedagogy with technology. A range of workshops will enable you to explore several focuses, including technology for the study of history, creative use of technology, innovative use of VR and AR, technology to enhance science learning, working with stories about Windrush and a look at women in history. This talk will explore how we can teach pupils to critically evaluate a range of sources on the web, considering how we can teach pupils to evaluate primary and secondary sources of historical as well as other information. Drawing on London CLC’s teaching experience and work with a wide range of partners, this talk will offer a proposal to teachers and senior leaders: that enabling and empowering critical and discerning learners is an essential activity for the classroom, not a bolt-on option. We will explore some practical ways to engage children in critical evaluation of digital information in a range of contexts, supporting their learning and development both as consumers and creators of content of all kinds, fact and fiction included. 12.50 – Lunch – including a showcase of Virtual Reality and Augmented Reality to support learning. Technology enhanced learning across the curriculum and what evidence says about how we should use it: will explore some key activities and tools with technology that evidence says improves outcomes for learners. It will look at four high impact strategies, look at what the research says and then show how they can be practically implemented in the classroom. Sarah is director of London Connected Learning Centre which supports schools in extraordinary learning with and about technology. Sarah was previously a primary teacher and deputy headteacher, and she now works with schools providing professional learning for teachers and strategic advice for school senior leadership teams. Technology-supported professional development for teachers: lessons from developing countries. London: Education Development Trust. Christian has a wide range of experience of supporting a schools to adopt effective, evidence based approaches to impacting on learning with technology. Originally a music teacher, who went on to teach multimedia and music technology to all ages he has been involved in developing innovative uses of technology in education as part of being deputy and acting manager of Luton CLC, as a local authority advisor and as an Apple Professional Learning Specialist. He recently ran the first Apple Digital Leadership Academy working with leadership from schools using iPad on a 1:1 basis. Caitlin has been working at London CLC since 2014, delivering workshops and professional learning to primary school pupils and teachers with a particular focus on creative digital. She began her career in music technology before taking a year out to train as a clown. Caitlin is a Google certified educator, an Apple teacher and is Google certified in online marketing. She is also the voice of several BBC Bitesize animations. Delegates are invited to attend one workshop in each of the three sessions. Spaces will be allocated on a first come, first served basis, and workshops will run according to demand. Bring individual people from the past to life in this hands-on workshop with three creative technology/art/speech activities offering an inclusive and flexible approach. In this workshop, participants will explore imagery and resources from a variety of sources including the British library and museum of London. They will then go on to look at creating a 1950s style news report about Windrush inspired by video from the age. In this workshop, participants will travel the world with Google Earth and make digital firework displays as they explore how a variety of digital RE-sources (see what we did there?…) can be used to research and present learning around pilgrimages and festivals. This workshop will explore how apps can be used creatively to support learning about in Art and Music and how we can convey meaning through Music, Photography and Art. Research shows that only 17% of Wikipedia entries dedicated to notable people are for women. This workshop will showcase the sometimes-overlooked women of history and look at the resources available to support you in embedding their stories in your teaching. 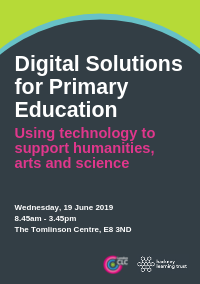 This workshop will explore a range of digital software, apps and hardware that can support learning in Science including exploring sound, Purple Mash tools to support Science and logging data. £190 + VAT per delegate – normal price. Book your place on this conference through our online booking system.